UNIQUE HOME WITH HAIR SALON AVAILABLE NOW! • 1200 sqft , 3 bath 2 storey – FOR SALE CAD134,900 . Attention Investors!!! Endless possibilities with this gem! 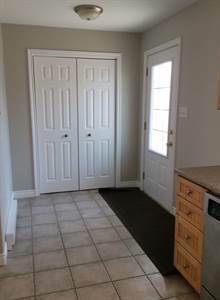 Currently has a Hair Salon, a very unique and comfy one Bedroom main residence (2 levels) and a completely finished basement (with its private entrance). Basement has eat-in Kitchen, Living Room, 2 rooms (non-conforming windows) and a 4 piece bathroom. Rent out the main residence for at least $600 per month along with the salon for at least another $600 per month! Bonus: Seller is willing to include her clientele to a starting Hairdresser/Hairstylist! This home is cozy and was extensively renovated 15 years ago: Concrete foundation, New Windows, Electric Wiring, both panels were updated to Breakers, and more! Main level has kitchen and large living room with space for dining area. Wall that separates kitchen from Hair Salon can be removed (empty wall) to use Hair salon as a large dining room, den, etc. The upstairs bedroom is large & open concept with a Corner Jacuzzi tub. This property offers 4 parking spaces. 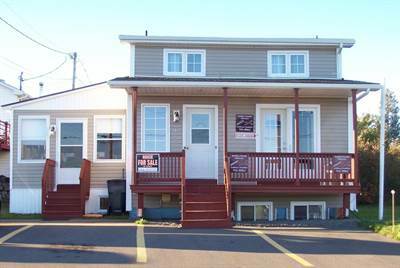 You will enjoy the beautiful view of the Bouctouche River and Le Pays de la Sagouine. Walking distance to restaurants, shopping, etc. Don’t miss out, call your REALTOR® for your private viewing!